Sushi has become a very popular dish in the past few decades. As healthy eating and shying away from carbs has become a way of life for many, sushi has fit the bill as a perfect meeting of the minds of those who want to eat healthy without sacrificing a truly satisfying culinary experience. Whether you’re a novice in the kitchen who’s only experience with preparing fish includes the frozen atrocity known as fish sticks, or you’re an experienced home cook who’s been known to impress large dinner parties with delicious grilled halibut and roasted vegetables, you can make a mind blowing sushi that will leave you and your guests raving for more. Let’s take a look at making a very basic but satisfying sushi dish, a tuna roll. You’re going to need some basic equipment. You’ll need a rice cooker (you can prepare rice in a saucepan, but a rice cooker will give you a much superior finished product), a fish knife or a knife with a heavy, curved blade, a bamboo sushi rolling mat and some plastic wrap, a large bowl (preferably wooden), a wooden spoon, a cutting board, a colander, small bowls and plates for presentation, and some dish clothes for wiping your hands. Once you’ve confirmed you have the necessary equipment, go and purchase your ingredients. 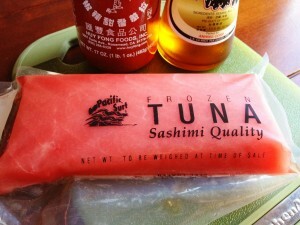 The tuna is, of course, the most important ingredient as it will be the star of your dish. The fish is not the place to skimp on costs. Spend the extra money to get sushi quality fish. Sushi quality fish should be very fresh. Look for brightly, colored fish. If it’s dull, dark or brown, leave it on the shelf. It should not have a strong fish odor. It should be smooth and firm, not slimy. Choose filets rather than steaks. If you have a local fish market or a grocery store that offers fresh seafood daily, these are your best bet for finding what you need. Next on the list is your rice. You need starchy, sticky rice. Go with short grained sushi rice. If you have an Asian market in your area, you’ll be sure to find it there. Lastly, you’ll need rice vinegar, Nori seaweed wraps and wasabi, which you should also be able to easily locate at an Asian market a large grocery store with an international section. Now it’s time to begin preparing your ingredients. Wash your rice in cold water. Continue to rinse the rice until the water runs clear. You want to remove the bran compounds and powder. You’ll need 3 cups of sushi rice (pre-cooked). Add the rice to the rice cooker with 3 1/4c water and set the time to cook. While the rice cooks, combine 1/3 cup rice vinegar and 3 tablespoons of sugar in a small saucepan. Cook over low heat until sugar dissolves and then let the rice vinegar mixture cool. 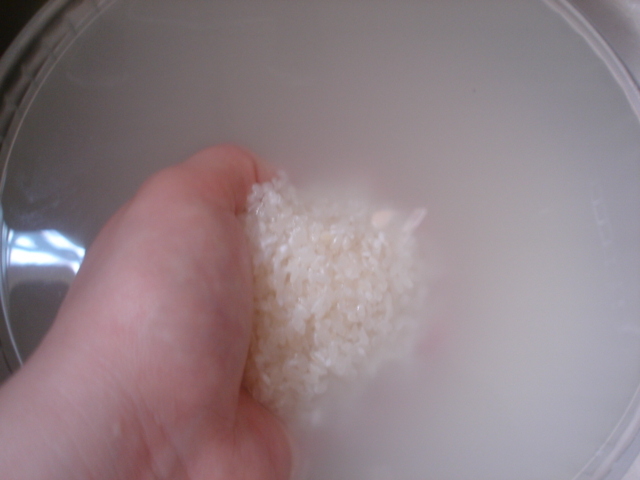 Once the rice has finished cooking, transfer it to your large bowl. Sprinkle the rice vinegar mixture over the rice in a crisscross motion and use the wooden spoon to cut the mixture into the rice. The next step is cutting your fish. Cut across the bias. As your piece of tuna is laying out flat, cut rectangular pieces of fish, fairly thin, about ½ inch thick. You can now begin assembling your tuna rolls. Have a small bowl handy with 1 cup of water and 2-3 tablespoons of vinegar. When you prepare your sushi, you’ll dip your fingers in the water and vinegar so the rice does not stick to your hands. Cover your sushi mat with plastic wrap to prevent sticking. Place a half sheet of the Nori seaweed wrap shiny side down on your mat. Dip your hands in the water vinegar mixture. Grab a small handful of rice and cover ¾ of the Nori sheet lengthwise with the rice, leaving the top ¼ of the sheet empty. Make a groove in the center of the rice. 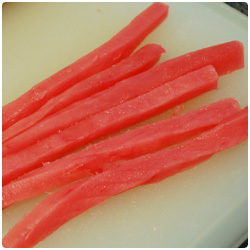 Place a piece of tuna in the groove and add a small drop of wasabi to it (no bigger than pea-sized). Use your fingertips to hold the sushi ingredients in place as you begin to roll the sushi. You’re going to roll the mat with the sushi wrapper facing sideways, supporting the ingredients with your fingers. Once the two ends of the Nori seaweed wrapper meet, press gently on the mat to flatten the sushi roll ever so slightly. This will help everything stick together and seal. Once you’ve rolled the sushi, let it set up for a few minutes then use a wet knife to slice the sushi roll into 6 equal pieces which you may then plate and serve. Sushi can be a challenging dish for beginners, but with a little practice, you’ll be an old pro in no time. Don’t let the complexity of this dish scare you away from trying to make it at home. 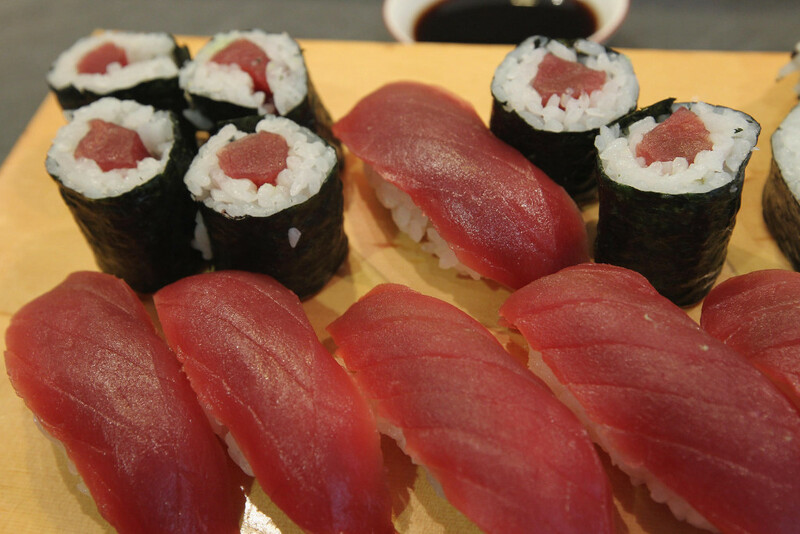 A basic tuna roll is much simpler than you might imagine and you can do it!